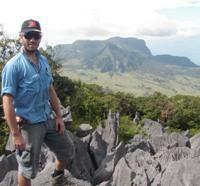 Thesis: Strike-slip deformation in a young orogenic belt: an example from Timor Leste. Timor Island, situated approximately 600 km north of northwest Australia, is the orogenic product of the collision of the northern edge of the Australian continental plate with the Banda volcanic arc. Collision has produced a complex fold and thrust belt comprising rocks of the Australian continental margin, rocks of Asiatic affinity, and more recent synorogenic deposits. The results of our recent fieldwork suggest that very young high-angle strike-slip faults may be responsible for much of the present-day topography of the island, including the exposure of a strike-parallel chain of steep-sided limestone massifs which extend across Timor Leste. At least one of these massifs appears to be a pop-up structure within a restraining bend of a plate-boundary parallel sinistral strike-slip system. The aim of my current research is to use detailed structural and stratigraphic mapping to better define the extent of recent strike-slip deformation throughout Timor Leste, and to investigate the role that these young faults have played in the morphology and uplift of the limestone massifs. There are over 30 known oil and gas seeps in Timor Leste which have encouraged petroleum exploration since early last century. Structural models used for petroleum exploration within Timor Leste presently focus on structural styles such as thrusting and folding, developed during collision. However recent research suggests that these models should now take into account post-collisional strike-slip deformation, which may have positive or negative effects on the petroleum system. It is possible that fault-bounded structures within the strike-slip zone may form possible petroleum traps, particularly where these structures are still overlain and potentially sealed by synorogenic mudstones. However, pre-existing structural or stratigraphic traps may also be compromised by newly formed subvertical strike-slip and oblique-slip faults, resulting in trap leakage, particularly if these faults have a dilational component. There may be a correlation between late stage strike-slip faulting, and the occurrence of fluid seeps (oil, gas and hot springs) within Timor Leste. One of the aims of my research is to use detailed structural mapping to test and describe this correlation.